After a year of foundational coursework to learn basic studio practices, Merike discovered ceramics, which allowed her to really engage with her materials and to begin doing what she now considers integral to her practice: experimenting. She spent the rest of her time in school casting, hand building, and blowing things up with fireworks. The fact that Merike has a sculptural background is hardly surprising; many of her artist’s books have pushed the limits of the book form. Her piece “Lover’s Game” is a repurposed vintage two-drawer cabinet that once held watch parts in small glass vials, but now serves as a set of fragmented words and phrases meant to be arranged and rearranged by the viewer (reader). In other books, the structures take unusual shapes and narratives unfold in nontraditional ways: a house that opens up through the roof to reveal vintage land search documents, or a round carousel of portraits with drawers that hold objects revealing family secrets. Are they books? Sculptural objects? For Merike, the differentiation doesn’t matter and often collapses. “The book, for me, doesn’t need to look anything like a book,” she says with a shrug. Each book, splayed open in the middle, is different. Text spirals out of one in a frenetic swarm. 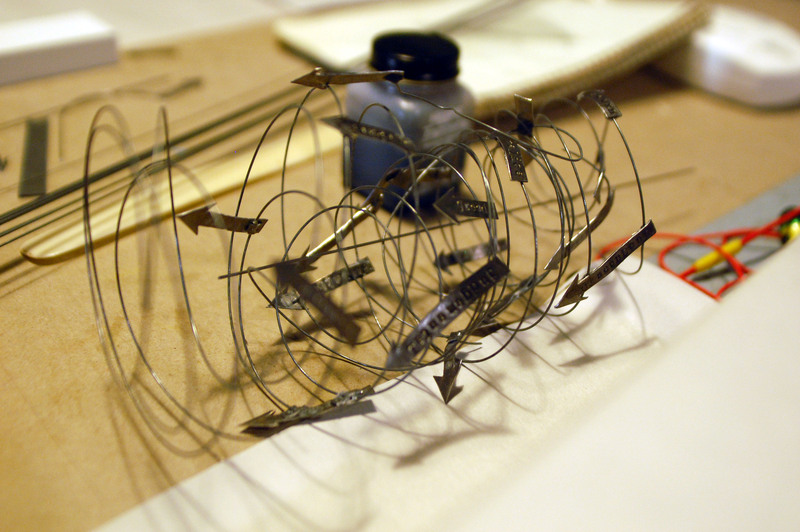 A ceramic head wrapped in wire sits atop another. One is a dull heavy gray, a lead sheet full of hand-stamped text forming its top layer. Others are delicate white on white. Quotations from sources ranging from Dr. Seuss to J.D. Salinger are stamped into small lead sheets, resting like plaques against the whitewashed pages. Years after first experimenting with it in art school, Merike is still drawn to lead for its malleability and softness, as well as its toxicity. Merike has removed one book from the series that has elicited oohs and ahhs from just about anyone passing her workstation in the last few weeks. What resembles a curling paper flower blooms out of the pages of a book Merike tried to blow up. But it didn’t explode quite right and it doesn’t fit in: everyone keeps thinking it’s meant to be a flower. The decision to move on was easy. Process-driven and adventurous, Merike is motivated by the challenges of new techniques and materials. 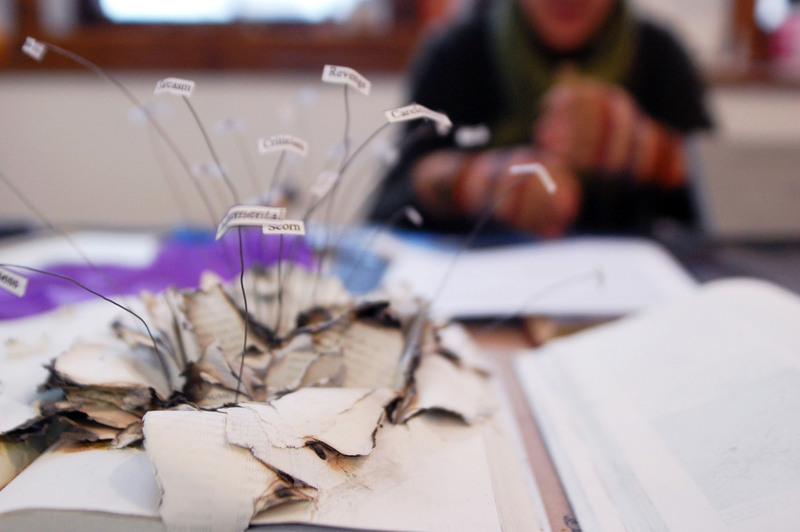 The range of her practice (also including collage, sculptural papermaking, and eco printing) is proof of that spirit. 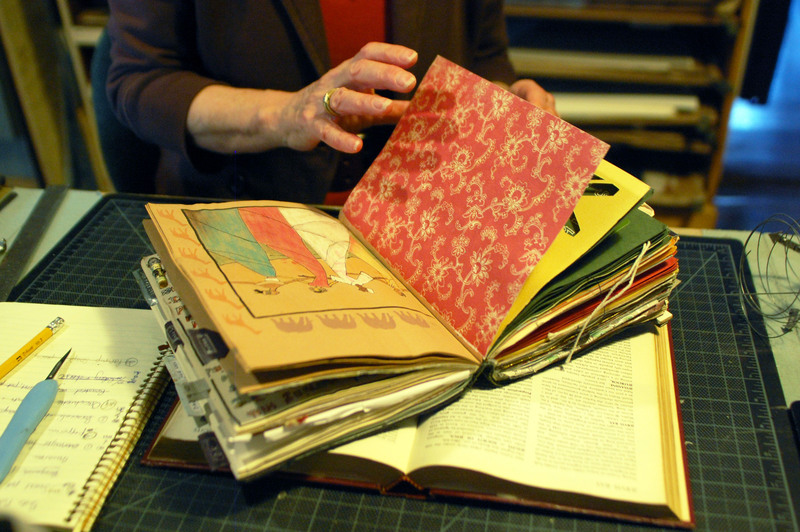 And so are her journals: fat, colorful handmade books packed with collaged papers and images, with found objects poking out of the pages:, a place to simply engage with new materials. Sometimes new ideas come from the journal. Sometimes they don’t. Merike van Zanten is a Dutch mixed-media artist who holds a BA (hons) in ceramics from University for the Creative Arts in the UK. She is based in Massachusetts, and has work in private collections in the Netherlands, England, and the US. If Merike could sit down for coffee or tea with any women artists, she would choose Robbin Ami Silverberg and Lynn Skordal. See more of Merike’s work at www.doubledutch-design.com and check out her blog for more on her project.